Now here's a funny thing, you start out with quite a straight forward enquiry and things quickly turn into something rather less simple, take for example this portrait of Sir Anthony Cope. The image is reproduced, rather poorly it must be said, in William Pott's History of Banbury (Potts 1978: 119), I have the second edition but I assume it was included in the first edition of 1958. Jeremy Gibson also uses it in his piece for the Cake and Cockhorse 'Heraldry, Horology and Horticulture at Hanwell' (Gibson 1988: 16). In both cases it is captioned the same way, 'Sir Anthony Cope, Bt. of Hanwell, M.P. for Banbury from a portrait at Knole Park, Sevenoaks.' Although it is not very clear here the painting bears the inscription towards the bottom left hand corner 'Anthony Cope of Hanwell'. We will address the question of which Sir Anthony this is a little later. spectator, long, natural, light-brown hair, wearing black with a lace collar. Pillar and building to the left, distant horizon with cloudy sky to the right. The original is in Viscount Cobham's collection. So what are we to make of this? 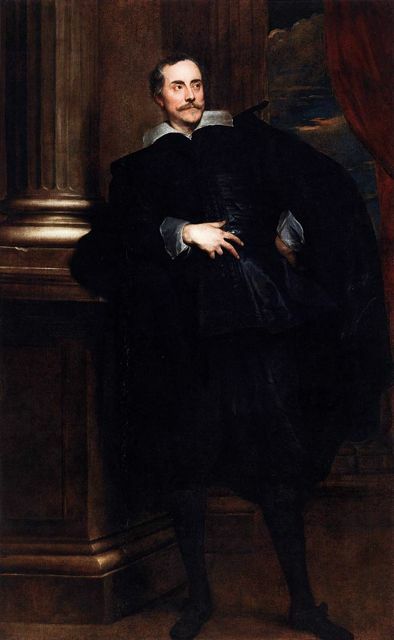 Could Van Dyck have painted a picture of Sir Anthony, now in the Cobhan Collection? 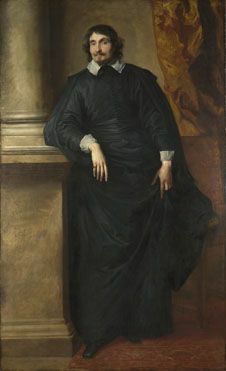 Van Dyck settled in England in 1632 eighteen years after the death of Sir Anthony, the first Baronet, and he died in 1641 when Sir Anthony, the fourth baronet,was just nine years old. It looks as if a sitting really wasn't on the cards for either Anthony. 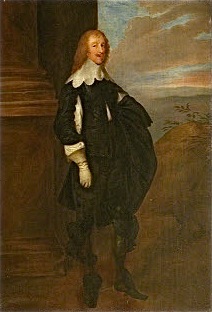 In both cases we have a soberly dressed gentlemen, standing and slightly turned to his left with his cloak over his right arm and architecture behind his right shoulder. The main difference, apart from the curtain to Sir Anthony's right and the open landscape in the case of the unknown gentleman, lies to my eye in the rather ungainly posture of the first figure. The shoulder is dropped, the neck perhaps a shade too long and the arm hangs straight and rather limply. The slightly awkward stance of Sir Anthony speaks to me of it being a copy of the altogether more natural pose in what is in itself a copy, albeit a better one, of a Van Dyck original. The other feature worth pointing out is Sir Anthony's hair cut, full enough but a little more severe that the flowing locks of the figure of the unknown gentleman. 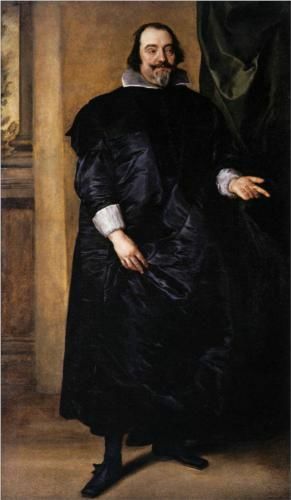 Sir Anthony died in 1614, when Van Dyck was only 15. So more probably his eldest son. Thanks the House and collections Manager Helen Fawbert for this. Clearly someone has spotted the Van Dyck date problem. It could be William I suppose but how has it then come to be mis-labelled? Here is my best guess at the moment. 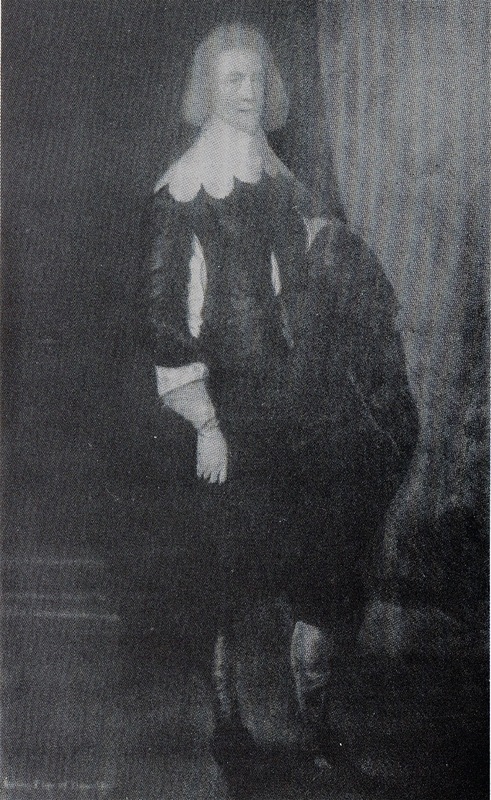 Some time between 1632 and 1641, and possibly earlier rather than later, Van Dyck painted an unknown gentleman, except of course he wasn't unknown at the time. At some point later, and it could have been much later, the need arose for a portrait of Sir Anthony Cope. Somehow the Van Dyck or the Van Dyck copy came to hand and a further copy made to portray Sir Anthony. 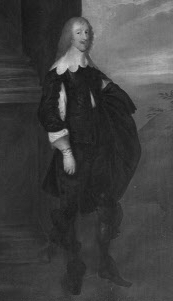 If this was to be the first baronet, the puritan, he would need a haircut, so there you have it. Several puzzles remain. Why did the copy and a possible copy of a copy end up at Knole? The fact that the Unknown Gentleman is 'on loan from the Sackville Estate' must be significant as the Sackvilles descended from the Bruern branch of the Copes. Why does the inscribed version not appear in the Trust's catalogue, has it been taken somewhere else? Of course this is all what Holmes would have described as 'theorising in the absence of facts' so we have potentially at least three similar paintings to track down and examine before we can even approach certainty. Sounds exciting.